Chronic Kidney disease (CKD), can occur as a result of various diseases and health conditions. Malnutrition is a common problem in most last-stage CKD patients because of the metabolic and endocrine disturbances that lead to poor appetite and weight loss. Thus, assessing the nutritional status of these patients is of paramount importance. The Approach includes a dietary assessment, physical examination, and laboratory examination. Dietary assessment includes questions on patient's loss of appetite, loss of weight, or development of gastrointestinal symptoms such as nausea or vomiting. It also enquires into issues such as access and affordability of food, ability to prepare meals, and the role of family members in food preparation. Among patients with difficult-to-control hyperkalaemia or hypophosphatemia, a dietary recall may be helpful. The dietician should be aware of the presence of concomitant problems that can affect nutrition, such as alcoholism, diabetes mellitus gastrointestinal disease, and dental disorders. It is recommended to perform subjective global assessments (SGAs) of these patients at the initial visit and on quarterly basis to determine the nutritional status of these patients. 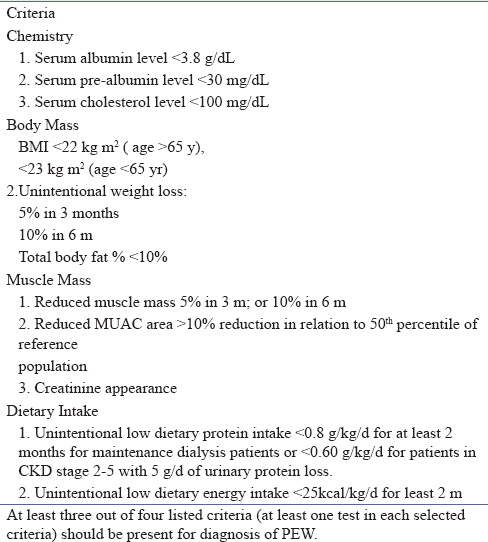 SGA evaluations, show whether any changes in nutritional status have occurred throughout the course of the disease, and are critical for identifying patients who are nutritionally compromised in any stage of CKD or in danger of becoming malnourished. Weight is used to calculate the body mass index (BMI) and to monitor for weight loss. Given the dependency of the weight on the height, BMI is a better measurement of body mass than body weight alone. In some patients who cannot achieve post dialysis euvolemia for a variety of reasons, monitor the trend of their weight with simultaneous assessment of interdialytic weight gain and volume [Table 1]. As in the general population, a low BMI or unintentional weight loss are consistent predictors of poor outcome and high death risk in maintenance dialysis patients. Unintentional weight loss or reduction in BMI of any degree suggests the presence of (protein-energy wasting) PEW in dialysis patients. 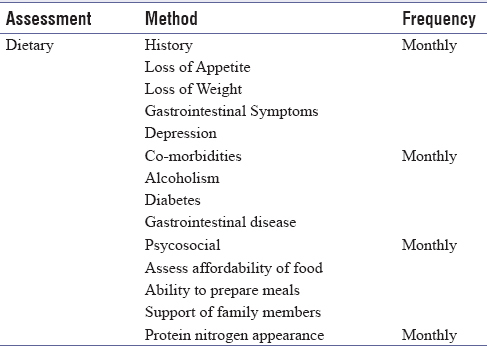 The ISRNM panel (The International Society of Renal Nutrition and Metabolism) recommends that a loss of 5 percent of nonedematous weight within three months or an unintentional loss of 10 percent of nonedematous weight over six months should be considered an indicator of PEW independently of weight-for-height measures [Table 2]. A decline in BMI over time may be associated with increased mortality. Diminished functional status as measured by handgrip strength. Laboratory assessment: Serum albumin and pre- and postdialysis BUN monthly. BUN is used to calculate the PNA (protein nitrogen appearance). Urea nitrogen and PNA— malnourished patients often show a gradual reduction in BUN. Low predialysis BUN levels have been associated with increased mortality. However, in addition to protein intake, BUN levels are affected by residual renal function and adequacy of dialysis. The PNA calculated from the BUN better estimates protein intake in the stable patients. Skinfold thickness or mid-arm circumference (MAC) is not used in routine clinical practice. Nutrition assessment directs the required nutrition support and has a positive impact on the overall health of CKD patients. Serial monitoring of selected nutritional parameters in the same individual may improve the sensitivity of these measurements to detect changes. However, as with all of the available tools, Nutritional assessment should be used in conjunction with anthropometric, laboratory, and dietary intake measures to form a comprehensive nutritional assessment.